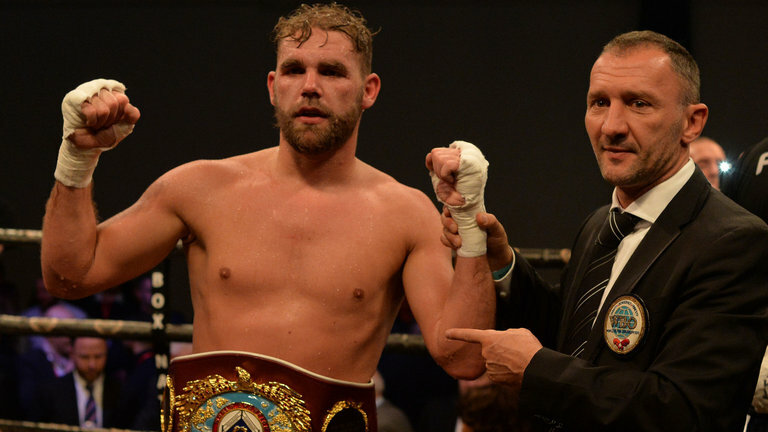 Billy Joe Saunders has signed to fight Martin Murray on April 14 in a venue soon to be announced, but expected to be the o2 Arena in London. For Murray this will be the fifth time he has contested a world title and seeing as Saunders is arguably in the form of his career and Murray aged 35 years old and with 41 fights on the ledger, it is unlikely that this seemingly final opportunity will eventually be the occasion on which he breaks his title duck. Murray had trouble finding opportunities early in his career until he snapped up a chance to take part in the Prizefighter tournament in 2008 and won the competition. Winning that on Sky Sports did not curry any favour with Matchroom promoter Eddie Hearn at the time though and Murray trod the boards in the small hall venues while being managed by Ricky Hatton. Defeating Nick Blackwell in a Commonwealth and British title affair in 2011 opened the door to a shot in Germany at Felix Sturm’s WBA super-middleweight title and the first of his shots at world honours. Murray outlanded Sturm for the majority of the fight but Sturm kept his strap by virtue of a split draw on the cards. Murray went on to give a great account of himself in Argentina when pushing Sergio Martinez close in 2013 for the WBC middleweight title but he was soundly drubbed in Monaco two years later by the unforgiving fists of Gennady Golovkin. Martin’s heart and fortitude were in display that night as he soaked up punishment for multiple rounds before finally folding late on. Courage and will to win has never been lacking in Murray throughout his career and you would imagine he possesses the ability to see out the distance against Saunders, although it will be an huge struggle to put enough rounds in the bank to win the contest. In fact Murray has been chosen as an available “name” opponent to extend Billy Joe and keep him active, both in the ring and training, while he waits for the winner of Gennady Golovkin and Saul Alvarez to emerge. Saunders is coming in to his fourth defence of the WBO middleweight title off the back of a career-best boxing display away in Canada when he defused and confused heavy-handed but one dimensional Montreal knockout artist David Lemieux. More recently Murray extended Arthur Abraham the distance in a WBO super-middleweight tilt and took it to a split but had to make do with the sentimental plaudits of the Sky commentary team that night, claiming once again that he had been hard done to rather than actually pushing over the line and comprehensively taking home the belt. Murray’s deal with Hearn (which are usually only for one or two fights at a time. as Eddie only retains very few fighters on permanent long-term deals) has now expired and he is able to pursue other offers. I cannot really see a way for Murray to win this one. He’s 35, not a concussive hitter at the highest level and despite being a middleweight with bags of toughness and good fundamental boxing skills he will be on the end of a routine 12-round points loss to Saunders.